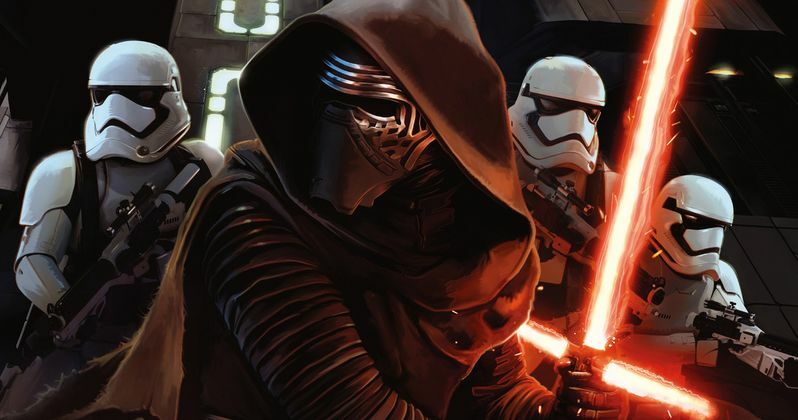 Star Wars: The Force Awakens continues to shatter box office records throughout its first week in theaters. Despite facing four new releases on the crowded Christmas holiday weekend, Director J.J. Abrams' sci-fi blockbuster faces four new releases opening on Christmas Day, Star Wars: The Force Awakens prevailed once again, taking in a massive $153.5 million in its second weekend in theaters. The blockbuster has set yet another record for highest second weekend, breaking Jurassic World's record set earlier this summer of $106.5 million. Star Wars: The Force Awakens also became the fastest movie to reach $1 billion worldwide, with $544.5 million domestic, $546 million international and $1.09 billion worldwide. Of course, none of this weekend's new releases, came close to this sci-fi adventure. Sony's Concussion, 20th Century Fox's Joy, Warner Bros.' Point Break and Paramount's Daddy's Home opened this weekend, with the studio's The Big Short expanding nationwide on December 23. The Hateful Eight and The Revenant also debut in limited release, before expanding nationwide over the next few weeks. In its second weekend, Star Wars: The Force Awakens dropped just 38.1%, with an impressive $37,136 per-screen average from 4,134 theaters. This weekend, director J.J. Abrams' blockbuster Star Wars: The Force Awakens also broke Jurassic World's records of being the fastest movie to reach $300 million, $350 million and $400 million,$450 million and $500 million, which all fell earlier this week. Of the four newcomers with the gigantic task ahead of them, Joy was expected to have the best weekend of the bunch, but Daddy's Home ended up coming out on top of the new titles. Daddy's Home took second place with an estimated $38 million, Joy earning $17.5 million in its opening weekend, in third place. Joy is the wild story of a family across four generations centered on the girl who becomes the woman who founds a business dynasty and becomes a matriarch in her own right. Betrayal, treachery, the loss of innocence and the scars of love, pave the road in this intense emotional and human comedy about becoming a true boss of family and enterprise facing a world of unforgiving commerce. Allies become adversaries and adversaries become allies, both inside and outside the family, as Joy's inner life and fierce imagination carry her through the storm she faces. Jennifer Lawrence reunites with Silver Linings Playbook co-stars Bradley Cooper and Robert De Niro, along with Edgar Ramirez, Isabella Rossellini, Diane Ladd and Virginia Madsen. Alvin and The Chipmunks: The Road Chip ($13.8 million) and Sisters ($12.7 million) took fourth and fifth, with Concussion debuting in sixth place with $11 million, The Big Short taking seventh place with $10.5 million and Point Break taking eighth place with $10.2 million. Of the four movies opening in wide release this weekend, Concussion has the best critical score on Rotten Tomatoes, with 65% "Fresh," with Joy scoring a 61% "Fresh rating. Daddy's Home is currently on the "Rotten" side with 38%, while there aren't enough reviews posted yet for Point Break to determine a Tomatometer score. Daddy's Home opens in 3,200 theaters this weekend, with Point Break opening in approximately 2,750 theaters, Joy opening in 2,700 theaters and Concussion arriving in 2,600 theaters. An exact theater count hasn't been given for The Big Short's expansion at this time, but we don't think it will crack the top 10 this weekend. Rounding out the top 10 is The Hunger Games: Mockingjay Part 2 ($5.3 million) and Creed ($4.6 million). The Big Short has been performing well in limited release, taking in $705,527 from eight theaters over the weekend of December 11, pulling in a spectacular $88,191 per-screen average. The movie expanded into 1,585 theaters. Earlier this year, Steve Jobs opened to astounding limited release numbers, only to flounder when it opened nationwide. We'll have to wait and see if The Big Short can avoid the same fate. The Hateful Eight also put up impressive numbers in limited release, taking 11th place with $4.5 million from 100 theaters, for an impressive per-screen average of $45,366. The Revenant also opened with an impressive $471,000 from four theaters, with a $117,750 per-screen average, while 45 Years earned $69,300 from three theaters for a $23,100 per-screen average.